This is a one shoulder blouse with a bow on the neckline. It snaps together in the back. This blouse in the rose pink color was also included in Satin ‘N Rose #1611 (1964). Do you know how to tell the difference in the skirts? 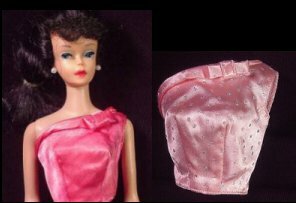 The black and white cloth Barbie tag was only included in one piece of an ensemble, and is found in the bolero in Satin 'N Rose. So if the blouse has the tag, it is this fashion pak item. If it does not have a tag, it is from Satin 'N Rose. The faux diamond stud earrings are very rare and very hard to find.